Five Star (ME), 9781432829209, 330pp. "When the home security alarm awakens Cait in the middle of the night she assumes there are bugs in the new system and has it checked out the next day. When the security company technician arrives he finds a halberd -- a Shakespearean weapon -- and a knife on the ground which are construed as evidence of an attempted break-in. Cait recognizes the knife. It's the same military combat knife found on Hank Dillon the bank robber she shot and killed two years ago while on duty as a cop in Ohio. 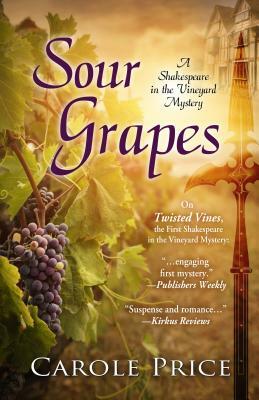 Sour Grapes is a fast-paced novel of suspense. Cait and Navy SEAL Royal Tanner reconnect romantically and her Shakespearean plays go on as scheduled.